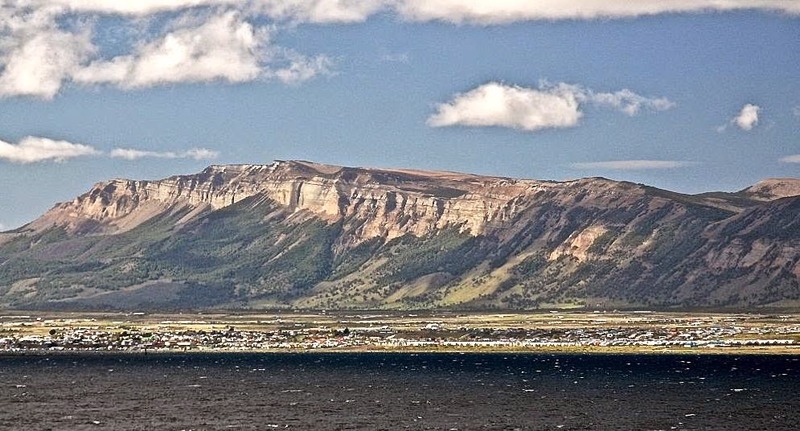 Thirty years ago, the seaside town of Puerto Natales didn’t have a single traffic light, but it was already the gateway to Torres del Paine – even though many if not most visitors were shoestring backpackers who thumbed their way to Chile’s most famous national park. Most of them stayed in town only long enough to acquire supplies for rugged treks that often meant a week or more with limited luxuries, to say the least. 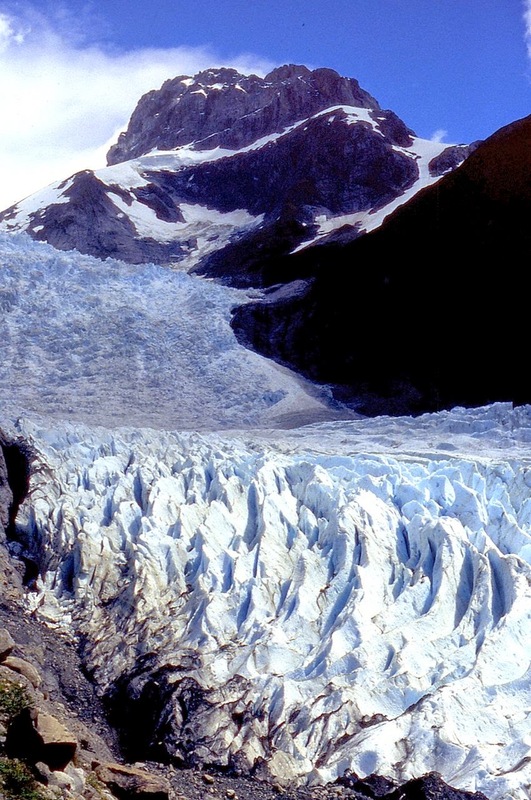 Today, with its modernized waterfront, innovative hotels and surprising sophisticated restaurants, Natales has become something of a destination in its own right – still the gateway to the park, but also the takeoff point for excursions including the day trip up Seno Última Esperanza (“Last Hope Sound”) to the Balmaceda Glacier (pictured above). That’s a full day but, even if there’s just an afternoon available before or after visiting Paine, there’s a rewarding possibility that fits in between lunch and dinner. That’s the short but scenic climb up Cerro Dorotea, the 549-meter (1,800-foot) ridge (pictured above) that overlooks Última Esperanza just to the north of town. It’s a short taxi ride to the trailhead, where local farmer Juan de Dios Saavedra collects a token trailhead access fee and, when you return, provides afternoon tea. The footpath, on private property, climbs steeply and then more gently to panoramic views of the sound and, on a clear day, Torres del Paine in the distance. There are forests of southern beech here, most of it secondary growth that includes some remarkable wind-flagged specimens. The wind, which often blows relentlessly, can be the most trying part of the hike – but that’s one reason why Patagonia is some memorable to so many people. Throughout Latin America, the quinceañera is a rite of passage that marks a stage in the passage from girlhood to adulthood. It’s a celebration marking the onset of adolescence, at least in the social sense – 15-year-old girls are ready to date, and it’s often an elaborate (and expensive) acknowledgment of that fact by her family. Argentina arrived at a similar sort of landmark Wednesday when, for the first time, the so-called Dólar Blue reached 15 pesos (the official dollar stands at 8.43 pesos, a breach of 78 percent). The Argentine government blames this on speculative attacks, rather than its own erratic economic policies and, even less credibly, on US Judge Thomas Griesa for the technical default on its foreign debt. For foreign visitors, as the Southern Hemisphere’s high season approaches, this promises to make Argentina a cheaper destination but, as I’ve written before, dealing with the informal exchange system can be complex for those who don’t know their way around. It also means, as I’ve noted, carrying a walletful of banknotes to make your purchases – at the blue market rate, the 100-peso note (Argentina’s largest) is worth less than US$7. Meanwhile, across the Andes, there’s no black market for the Chilean peso but, in recent weeks, the currency has also been declining. Since I submitted the manuscript for the upcoming fourth edition of Moon Handbooks Patagonia early this year, the rate has fallen from 550 to almost 600, so Chile is also likely to be cheaper. Unlike in Argentina, though, there’s no sense of panic on the part of Chilean government officials, who oversee a stable economy, honor their debts, and understand the ups and downs currency markets. 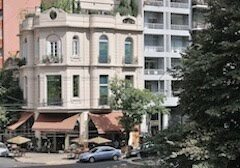 Nor do Chilean operators worry – much of their revenue comes in dollars, but their expenses are in pesos, so the decline actually benefits them. 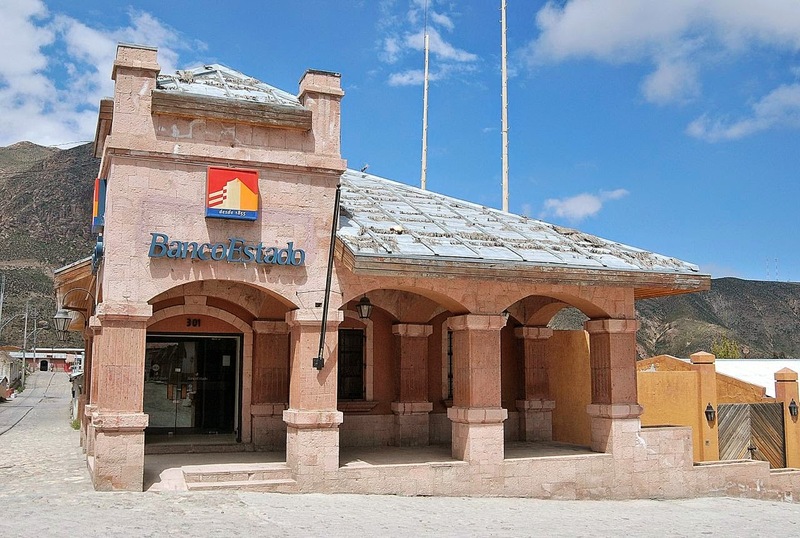 Visitors from overseas, meanwhile, can conveniently use Chilean ATMs without paying a penalty to do so and, when they leave the country, they can exchange their leftover pesos with only a minor loss. I might add that BancoEstado ATMs do not collect a commission on foreign users. In Argentina, though, it’s nearly impossible to turn your remaining pesos back into dollars or any other foreign currency, so plan wisely – try not to change more than you need - and spend whatever Argentine currency remains. Odds are that, even if you plan to return fairly soon, those Argentine pesos will be worth less (if not necessarily worthless). Argentine rock musician Gustavo Cerati, founder of the power trio Soda Stereo, died last week in Buenos Aires after a four-year coma. Larry Rohter, the New York Times South America bureau chief during much of the musician’s career, wrote Cerati’s obituary for the paper. The clip below shows him on stage with Shakira in the Argentine capital. Except for tango, and the occasional folk musician such as the late Mercedes Sosa, Argentine music has had relatively little influence beyond the South American continent. Even the major figures of rock nacional, such as the brilliant but erratic Charly García, haven’t had a great impact in the English-speaking world, though Soda did record one album in New York. I’ve seen García live, as well as Fito Páez and David Lebón, and listened to quite a few other Argentine rock musicians – I particularly enjoy the Dylanish León Gieco – but I never managed work up any interest in Cerati or Soda Stereo. Even my Argentine wife can’t recall anything memorable, and her sister’s husband – who still owns a CD shop and often provides me music – never saw fit to even mention Cerati to me. I don’t want to belittle Cerati, but my only real memory comes from a visit to the northwestern city of Tucumán when Soda Stereo was playing there. To promote the concert, a sponsoring tobacco company was passing out free cigarettes on the central Plaza 9 de Julio – ironically (or appropriately) enough for Cerati, whose three packs a day habit undoubtedly contributed to the stroke that put him in a coma at age 51. Argentina's tobacco laws have since changed, for the better, but I don't know whether or not this type of promotion is still legal. 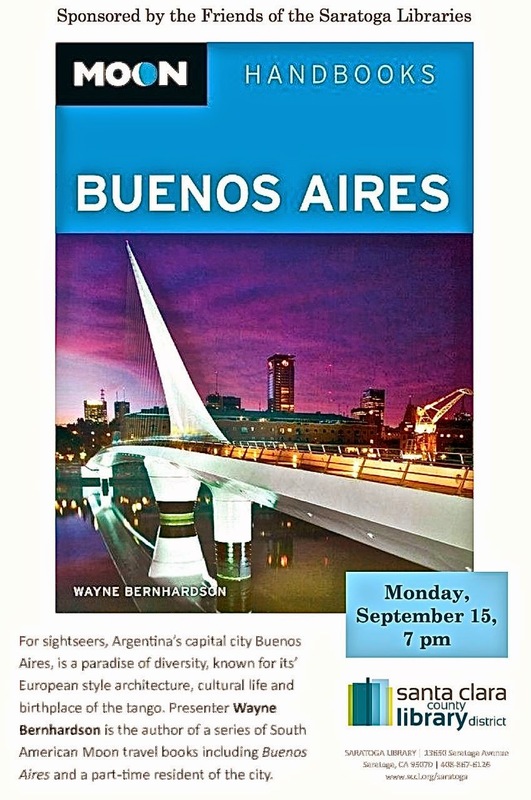 Next Monday night at 7 p.m., at the Saratoga Community Library (in Silicon Valley, near San Jose), I will present a digital slide lecture on travel to Buenos Aires. There will be ample time for questions and answers, and my Moon Handbooks to the Argentine capital, Argentina, Chile and Patagonia will also be available at (slightly) discounted prices. Having spent so much of my life on the road, I found it’s influenced my life at home in some unexpected ways. I always loved dogs, for instance, but frequent travel is not always conducive to caring for pets, but somehow I’ve managed to do it. I grew up with dogs and, though my parents’ preference was chihuahuas, I preferred larger breeds. 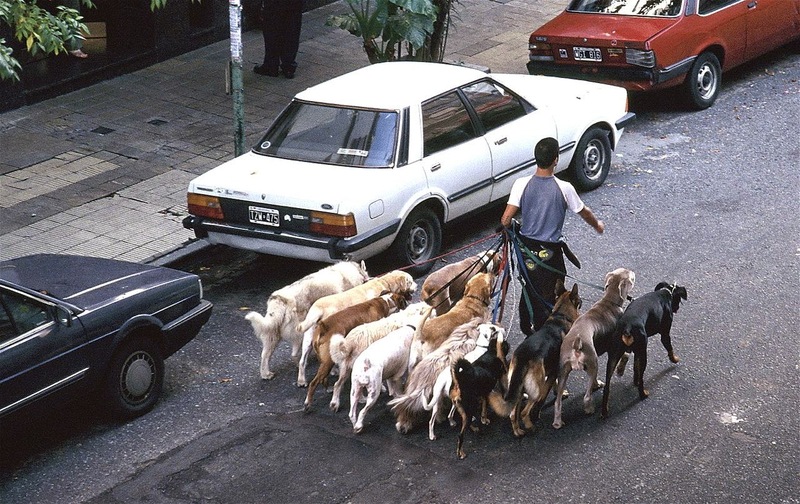 Occasionally, the two subjects come together – in Buenos Aires, the presence of dogs is unavoidable, and there’s a whole industry of paseaperros (professional dog walkers, pictured above) for apartment dwellers. 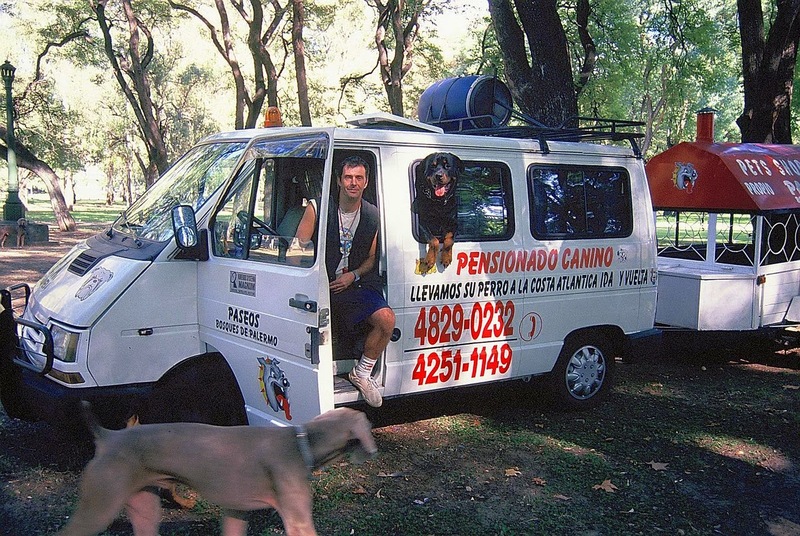 Some years ago, I wrote a magazine piece on dog walkers who shuttled their clients’ pets to the Atlantic beach resort of Mar del Plata for families without their own vehicles (as pictured below). Some dog walkers even take your pet from Buenos Aires to the beach. All the dogs of my adulthood have been rescues, even before that word became fashionable. 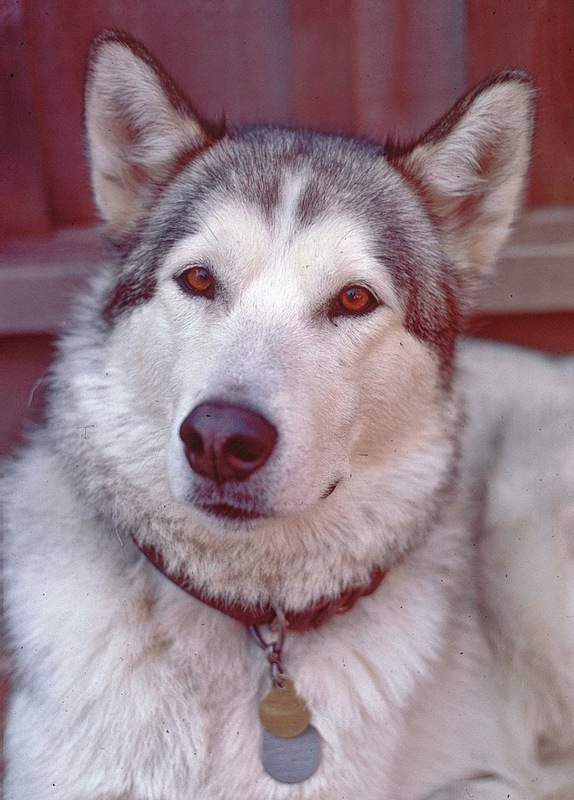 I grew to admire Alaskan malamutes when one of my Berkeley housemates had one and, when visiting my parents in Seattle, I adopted a four-month-old puppy from the animal shelter there – luckily, just ahead of a couple who would have chosen the same animal. Bronski relaxes after a day's hiking in California's Sierra Nevada. After adopting, I faced the question of what to name him, and I didn’t want to settle for a trite name like “King” or “Spot” or the like. At the time, I spoke German well and had traveled in that country, so I chose “Bronski” after the main character in Günter Grass’s satirical novel The Tin Drum – even though this Bronski (pictured above) rarely barked, let alone shattered glass with high-pitched shrieks. Still, it was a name – and a remarkable dog - that nobody ever forgot. Clouseau poses for a portrait. Bronski, sadly, died a few months before I married my Argentine wife, who liked dogs but leaned toward a golden retriever (I like goldens, but they’re a little too needy for my taste). Instead, I managed to contact a breeder with a purebred malamute that, unfortunately from her point of view, suffered from a genetic defect that made him unshowable. We named him “Clouseau,” after the character Peter Sellers made so memorable in the Pink Panther movies – his gaze perhaps suggests the character’s cluelessness – and Clouseau (pictured above) was always amusing, even when he shredded a large stuffed pillow that left the living room covered in foam. After that early puppy trauma, though, he was an exemplary companion, especially when our toddler daughter would drop food on the floor. 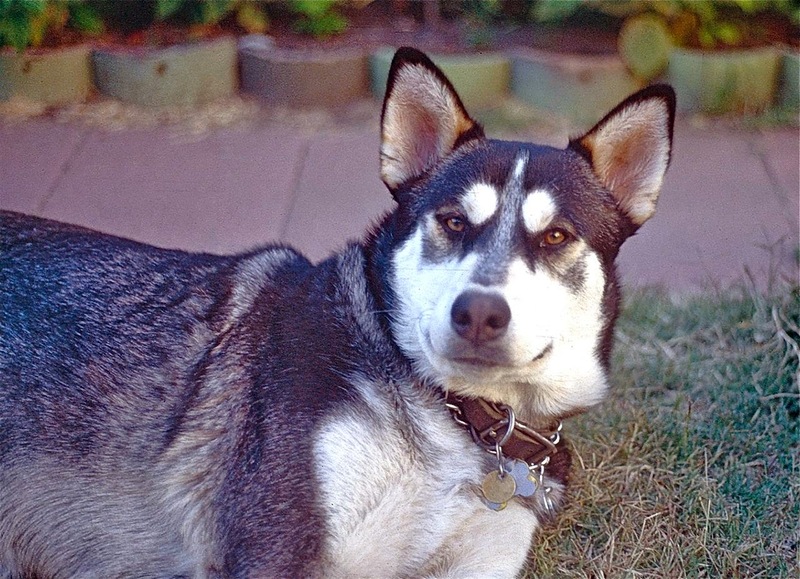 After Clouseau died, I used Malamute Rescue to find the dog who became “Gardel” (pictured above) whom we named after the legendary Argentine tango singer who died in a Colombian plane crash in 1935. Gardel is still the voice of tango, and his devotees insist that “Gardel sings better every day.” For our part, we always claimed that “Gardel barks better every day” even though he, like most malamutes, was rarely vocal. 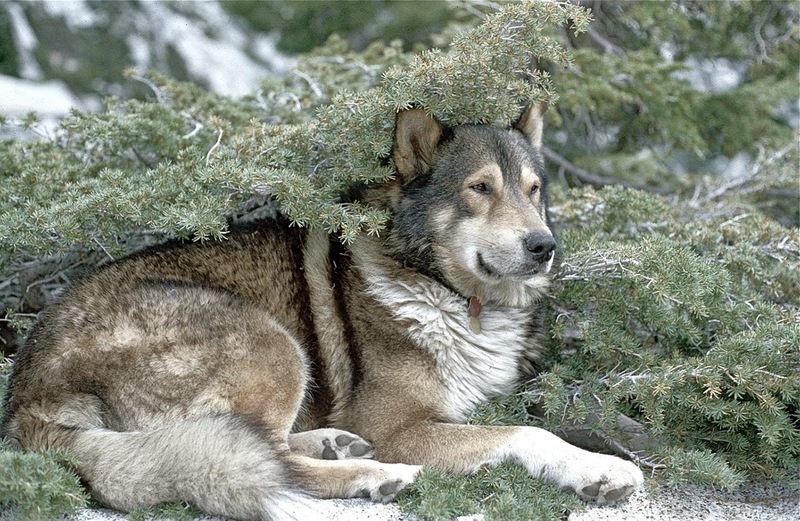 In personality, though, he was more needy than suave - something of golden retriever trapped in a malamute’s body. 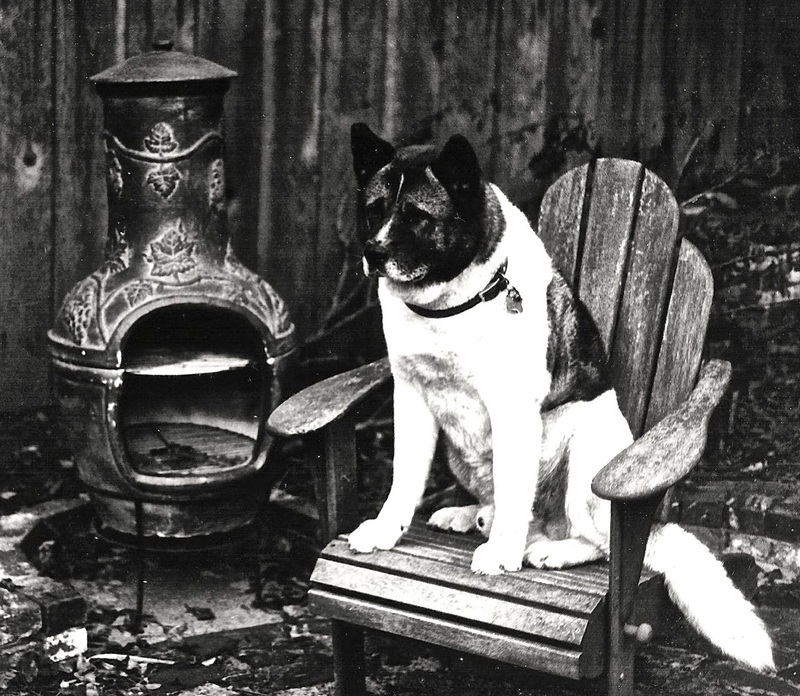 With Gardel nearing the end, my wife found and adopted an Akita at the Berkeley Animal Shelter, whom we named “Sandro” after the rock singer and balladeer who was Argentina’s counterpart to Elvis. Sandro (pictured above) was a placid animal who, unlike his Argentine namesake, was a low-key presence in the household even as he aged surprisingly rapidly – perhaps he was older than we originally thought. Malbec relaxes in the garden. 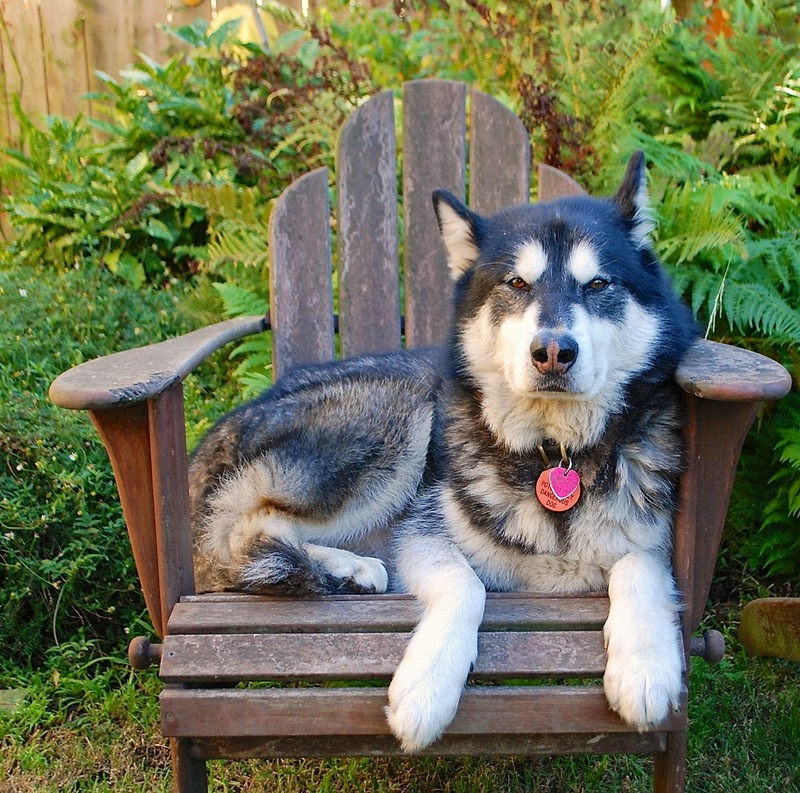 As Sandro declined, we again resorted to Malamute Rescue and found a young adult whose family was expecting a new baby and decided they couldn’t devote the time he deserved to him. They instead kept the family pug, more of a house dog, and we drove home with the dog who became “Malbec” (pictured above). He is now ten years old and, like his namesake Argentine wine, aging smoothly.